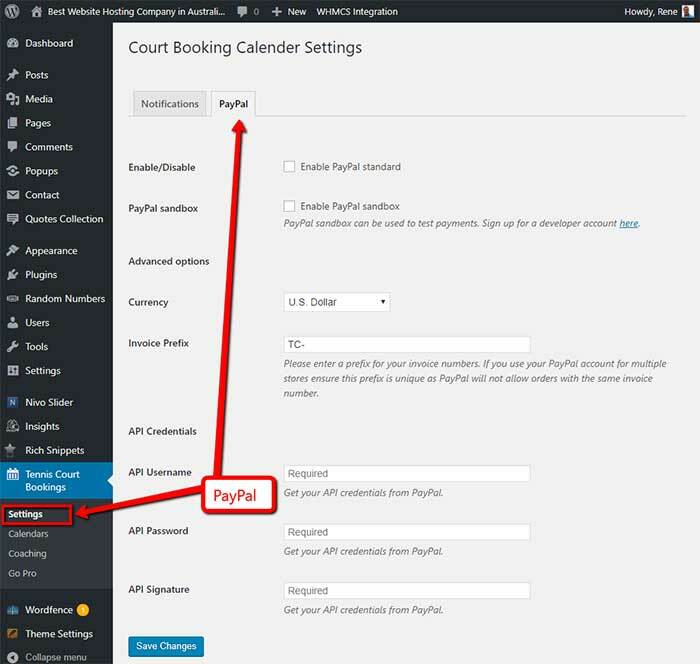 Ok, so you are having a look at the Tennis Booking Plugin for WordPress and want to know how to get started and use it. 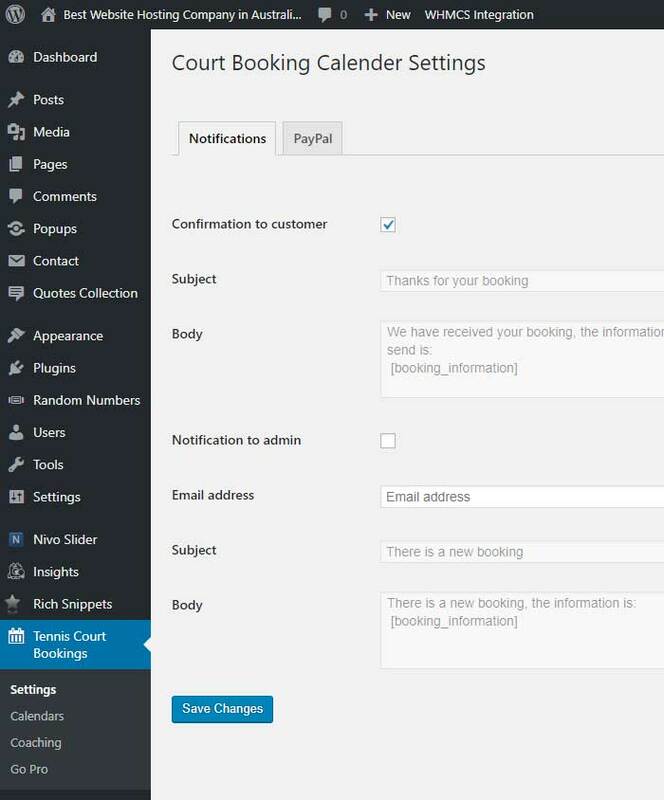 Then simply go to “Tennis Court Bookings” in the WP menu where you are ready to customise the plugin. Give your Calendar a name. In many cases this will simply be “My Tennis Club” where “My” is the name of your club. remember, you can have many calendars (clubs) if you like. These are simply the opening and closing times of your club in which players can book. Simply tick those days the players can book their courts. You can designate all those days the club is closed or at least not open for bookings. This limits the ladup time the players can make a booking. For example, you may want to set this to 1 or 2 hours. 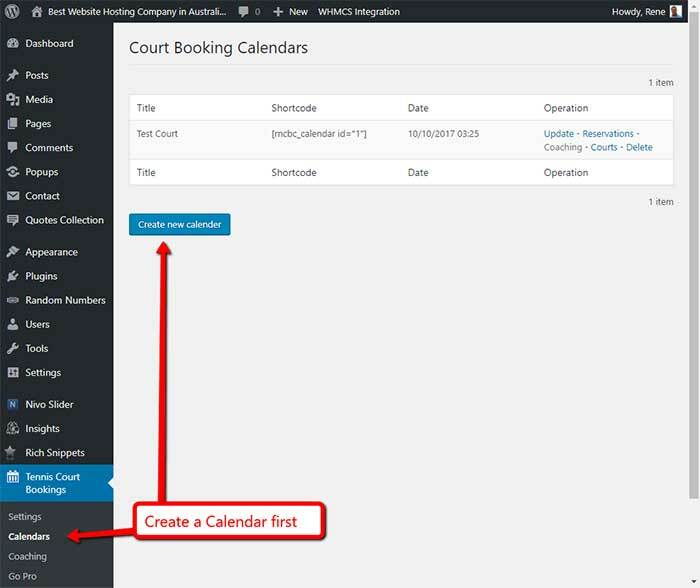 This will reduce those occasions that someone books a court with 5 minutes notice only to find the court being used by others that didn’t book. So if you set it to 60 minutes, a 3 pm booking needs to be made before 2 pm. This is if you want to be “open for business from today (default) or any date in the future. This is just a message your players will see on successfully booking their court. For example, “Your booking was confirmed. Have a nice game!”. 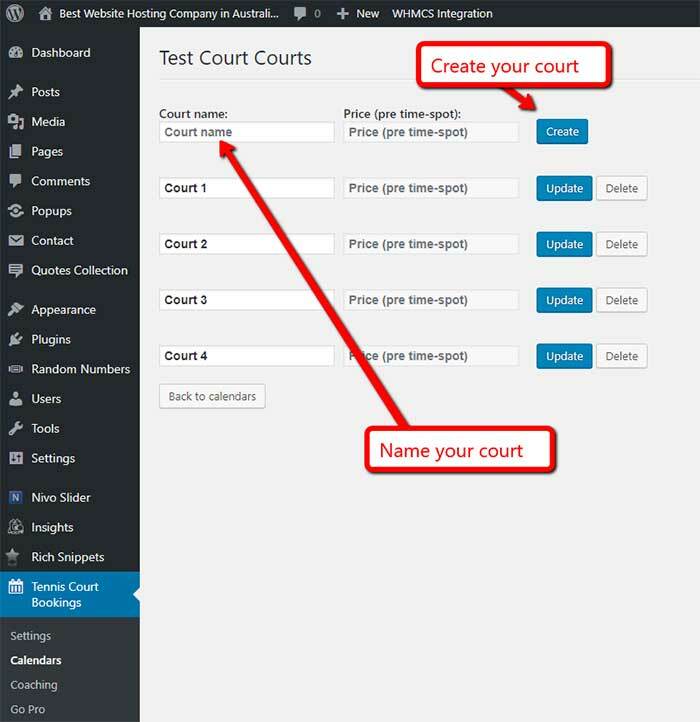 Now you have finished setting up your calendar (your club), you need to add some “courts”. Courts can be anything bookable. Now that you have your calendar set up and added some courts, you can finetune your tennis booking system. Simply tick the box if you want to send out a confirmation email to the player that just booked. You can also tick the box that emails a notification to the administrator. Note that the messages are generic. In the Pro Version you have the ability to edit the message. After you set up your Tennis Booking system, you need to display it on a page or post. To do this you simply copy & paste the shortcode that was generated. 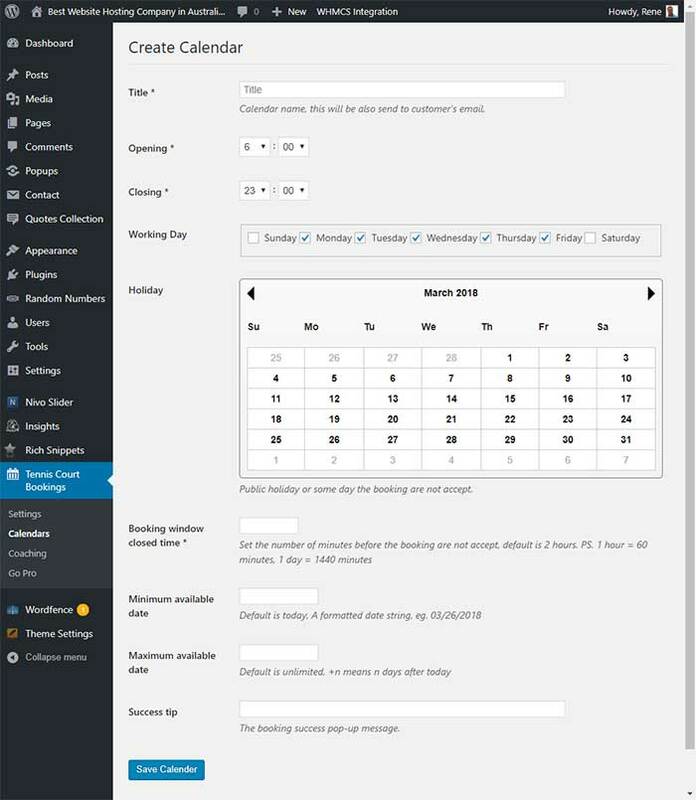 Place your calendar shortcode in any page and the booking system will render accordingly. Make sure you paste the shortcode as plain text in Visual mode and not text mode. When you “Go Pro” you will get more functionalities such as unlimited courts and other features a larger Tennis club may need. After purchasing your Pro version you will get an email with a key in it. 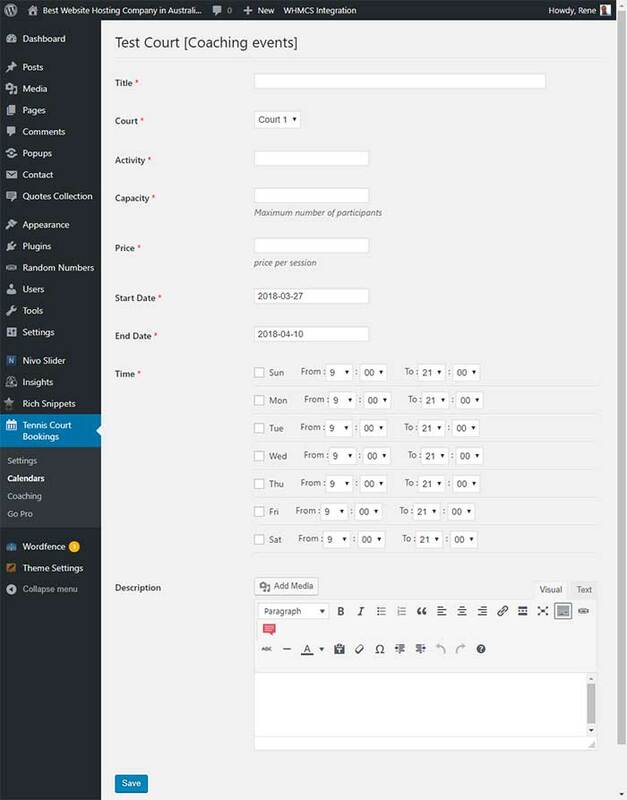 Copy and paste your key under “Go Pro” in the WP side menu under Tennis Court Bookings >> Go Pro. 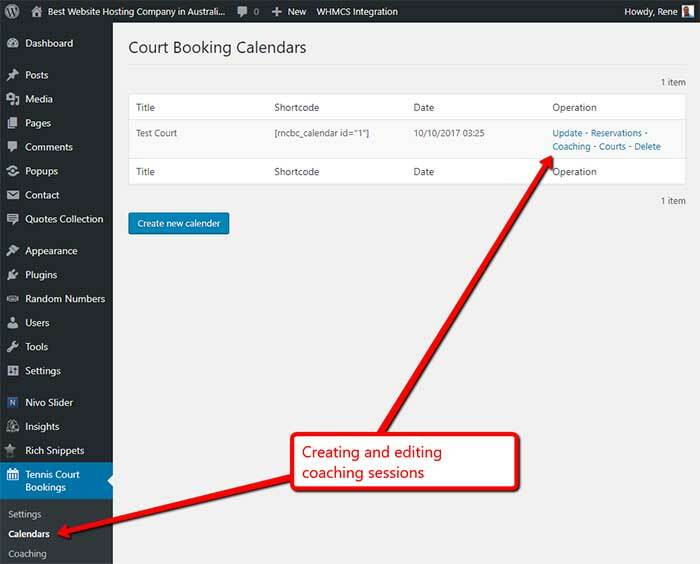 Sometimes it is handy for coaches to pre-book courts for their ongoing activities. This could be Weekly “Redball Session”, Once-off “Under 12 Coaching Clinic” or “Tuesday Night Cardio Tennis”. 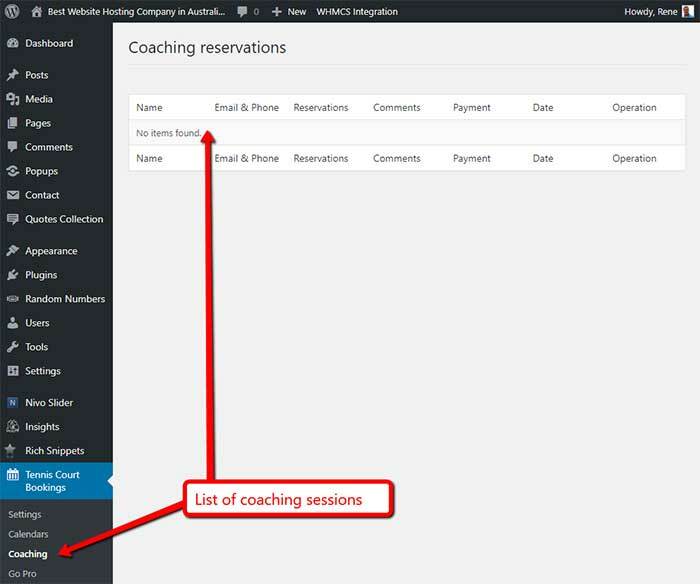 The coaching mod can block out regular weekly time slots so this suits regular weekly events. The coaching mod can also limit the amount of participants so there will be a count-down until the session is booked out. After purchasing this mod, you will get an email that contains a download link. 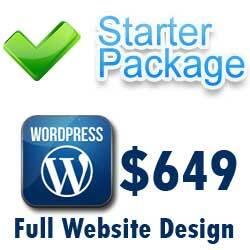 Simply download the extra plugin and install it the usual way as explained at the very top of this page. To create your coaching sessions you will need to go back to your calendar. From here you can go into the coaching session setup. Select on which of the clubs courts you are conducting the event. Just pick the appropriate court from the dropdown list. You can set the maximum number of participants (if any). The booking form will count down from this number until your session is booked out. Leave blank for no maximum. Here you can enter the price per person for you session. Enter the recurring days and time. Your session will repeat on those times and days and these will be blocked out for you on the front-end booking form. Group Coaching for under 12. Session runs for 50 minutes starting on the hour. Dress: tennis shoes and appropriate attire. Sunscreen and water supplied but a water bottle is required. If you want to test your PayPal connection and the system you just set up then you can tick this box. 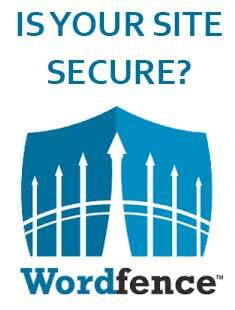 The system will work fully but no payments will be registered. Consider this your practice space. Set the currency you want players and participants to pay you in. Note that this must match your PayPal account. You can find these in your PayPal account.